'Best for first hand accounts of battle’: Featured among the Mail on Sunday Event magazine's 'Books of the Year' selection, December 2016. As seen in the Mail on Sunday: The Secret Somme, 100 years on, the epic battle as you've never seen it before. As seen in The Sunday Times: ‘Conspiracy’ to lure underage boys into war. Double page feature in the Daily Mail and the number one story on their website. Also featured in, the International Business Times and in the Express where images from the book have been used in their picture gallery launch. You'll be £14.99 closer to your next £10.00 credit when you purchase The Somme. What's this? Because of its legendary status, the Somme has been the subject of many books, and many more will come out next year. However, nothing has ever been published on the Battle in which the soldiers’ own photographs have been used to illustrate both the campaign’s extraordinary comradeship and its carnage. The result is very pleasant, both for the quality of the testimonies, very varied and original, and for their number. Van Emden is a historian of great quality. The author allows the officers and men to tell the story of the battle as it unfolded and as they saw it at the time. 'In the centenary year of the infamous World War I battle, this book brings the Somme vividly and luridly to life through the words and photographs of some of the combatants. The poignancy is heightened by the knowledge that many of these soldiers did not make it home. The words from the letters and memoirs etc. give vivid accounts of the day to day life they had to endure to survive, like keeping up communications, dealing with hunger, getting rest, obtaining supplies, dealing with vermin, making and maintaining trenches; all very harsh living conditions, never mind the actual fighting with the enemy and bravery of these men. The photographs very clearly illustrate the muddy, damp conditions from the harsh weather and the horrors and devastation which the soldiers saw, images which probably stayed with them for the rest of their lives. It is an easy read which describes the horrors of war and it makes no comments about the futility of the battle but allows the words of the men to speak for themselves. A book well worth reading. Richard Van Emden has delivered another excellent book on World War I that magically portrays this segment in time. The rare photographs are aligned with the timeline and add to the text greatly. This a wonderfully written book. The subject has been handled with the upmost care, accuracy and sensitivity. If you are interested in the subject don't miss it. A great book on a personal view of a battle that is celebrating its 100 anniversary in England for those who fought and died there. There are other good books on this battle and of WW1, but personal letters of those who were there gives insight in how life was in the trenches and back behind the front lines for rest before going back up when it was their turn back in the front line. Just started reading it, but the letter of a twenty year old infantry man who was tasked to show the commanding general of their company the trenches they were in, got the grand tour. The general came back muddy and filthy as those who were there and thanked the person who took him around. The last line of the letter was how often could a twenty year man do something like that to his superior and get away with it. Can't wait to get back to read the rest of this book. Quite superb! I read this after finishing "Slaughter on the Somme" by Mace & Grehan (a transcription of every war diary of every battalion who took part on the 1st July). Together the 2 books provide a much more evocative picture of the battle. Middlebrook, Macdonald et al provide the important historical taster, but to move onto the next level I cannot recommend the other 2 books highly enough. Richard van Emden’s “The Somme” is essentially an oral and visual history, and so largely avoids the historical debate about what went wrong and who was to blame. But it includes much new material, particularly in the form of photos taken by British soldiers on their own illegally held cameras, and sets the battle in its proper context by covering the entire 20-month period that the British Expeditionary Force spent on the Somme. It deserves to be read. Quite simply, superb. I found myself unable to put this book down. Anyone looking for a first-hand, soldier's account of the battle should read this. Another well researched, highly readable book from a great author. This is an excellent addition to the very extensive literature on the Somme, and the approach taken is a very effective way to give us the soldier's eye view of the British army's time on the Somme. 'The Epic Battle in the Soldiers' own Words and Photographs' is how the book describes itself and what could be more poignant than that? A disaster described by men on both sides. Very moving and well presented. Recommended. It is one hundred years since the Battle of the Somme began and now the last veterans have died a decade ago and civilian recollections are diminishing. The Somme: The Epic Battle in the Soldier's own Words and Photographs is published to mark the centenary of the battle, although the battle is only part of the legacy. The British occupied the Somme for nearly a year before the offensive began and for four months after it was officially over. The book tells this wider, twenty-month-long story, by utilising soldiers' recollections and nearly 170 photographs taken by the men themselves on their own illegally held cameras. Cameras had been banned at the battlefield and so the vast majority of these images have never been published before, giving a much more personalised account of time spent there. It is also an interesting format for the story is divided into eight chapters and the entire narrative is taken from the soldiers' letters giving a fascinating account of life at that time. This is a lovely volume that anyone interested in this time in history should not miss. This new book relays on the soldiers' own recollections, their letters and secretly-taken pictures tells the remarkable story of life on the Somme in the run-up to the battle and the grim reality of trench warfare. Essentially an oral and visual history, and so largely avoids the historical debate about what went wrong and who was to blame. But it includes much new material, particularly in the form of photos taken by British soldiers on their own illegally held cameras and sets the battle in its proper context by covering the entire 20-month period that the BEF spent on the Somme. It deserves to be read. This new book offers a vivid impression of what it was like to serve on the Somme. 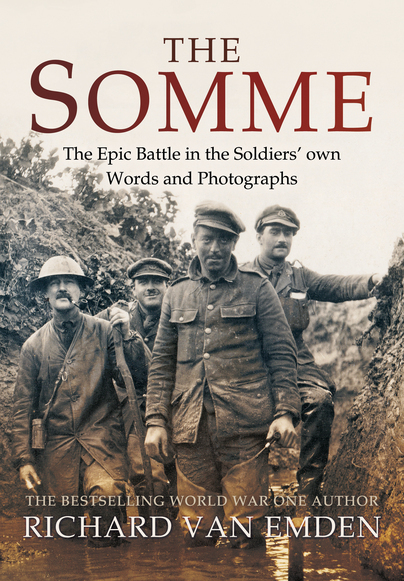 The Somme: The Epic Battle in the Soldiers’ Own Words and Photographs by journalist and historian Richard Van Emden is an oral and visual history of the landmark offensive from those who took part in it. Haunting first-hand anecdotes from survivors of the slaughter are interspersed with rare and in some cases never-before-published snapshots taken in the trenches on both sides of No Man’s Land. The 400-page volume is certainly worth a look. I can't recommend The Somme by Richard enough. I laughed aloud at parts and on more than one occasion, had to put it down to clear the dust from my eyes. Ahem. Sadly, I've finished reading it now- I say 'sadly', as I wouldn't have been disappointed had it been three times the length (and it's not a short book either). The authentic voice of the soldier really comes across- more so than in many other books I've read, and it was nice to see everyday routine things mentioned too, rather than just dwelling on the horror. A thoroughly recommended read. I can thoroughly recommend it. An essential addition to the Somme library. Great War historian Richard Van Emden combines a remarkably candid collection of more than 160 mostly unseen photographs, taken on soldiers' illegally-held cameras, with first-hand accounts from their letters, memoirs and diaries. The outcome is a haunting but compelling hidden history that makes our Tommies' Somme experiences as raw and real as if they took place only yesterday. A moving book. Despite knowing the overview which we have all learnt, the true horror, as always, is in the personal detail. The strength of this book lies in the juxtaposition of the often graphic battle accounts with the mundane, simple and humble detailing of everyday life in the trenches. Brilliant, absolutely brilliant. Some stories will make you laugh out loud, some will put a lump in your throat. With a great selection of photographs never seen in print before. Because of its legendary status, the Somme has been the subject of many books, and many more will come out next year. However, nothing has ever been published on the Battle in which the soldiers' own photographs have been used to illustrate both the campaign's extraordinary comradeship and its carnage. For those of us old enough to have met veterans and talked about their experiences, that is no longer possible for those who fought on the Somme. This collection of personal accounts, coupled with period photos, is what we have left to us for study today, and which will be an excellent reference if you were to take it with you and make a trip to the old battlefield, which today is a colourful and quiet countryside once again. As always with Richard Van Emden's books a well written book with the voices and photographs of those who were there.A book to reflect on and one which gave me a greater insight into my grandfather's time during the war.An excellent purchase. There have been many books written about the battle but this one provides a very slightly different slant on things. Richard van Emden, who has been involved in considerable research and programmes concerning the Great War, has written a most unusual history of the battle. It is well worth reading for those who wish to get more of a personal feel for that period of the Great War. Van Emden, a First World War specialist, marshals his material chronologically with considerable skill; he curates rather than comments, allowing the combatants to speak for themselves, matching where possible the images to the text. We have become inured to images of conflict, battle-weary ourselves perhaps; the testimony from this apocalyptic hell-hole should give us pause for thought. The bestselling author and expert on World War One has gathered together researched and edited one of the most moving and comprehensive books available for the centenary of the Battle of The Somme. Like those that have researched and studied history over many years, the only time you are really touched is when you read the words of those who were there and those that perished. This book is packed with these feelings and it is brilliant. In his introduction he quotes the historian AJP Taylor, whose views are today often ignored, ‘Idealism perished on the Somme,’ just about sums up the feeling of the soldiers. Whether we like the sentiment or not, Taylor’s point is just as valid today as when he wrote it, and this book justifies that sentiment. In a picture of 5 officers of the 9th Rifle Brigade 2 were to be wounded and the remaining 3 were killed in action, look exhausted, these men had to lead other exhausted men in to battle. Across eight chapters the reader is taken on a journey that deals with the harsh reality of battle, and when you are bogged down in mud how cold life, if you were surviving was. None of the chapters glorify in any way the Somme, but the harsh life the men face drips from every page, with their own words and pictures. With the words of tunnellers who had to carry 50lbs of explosives for the mines which they would blow up to aid the advance of the soldiers on the first day of the battle. Captain Stanley Bullock describes what it is like to be down there, that the job was the least desirable in the army and with the amount of explosives they were using they could blow the Germans back to Berlin. When you read some of the officers asking for reinforcements that were desperately needed and not getting a reply from headquarters, to the description of Thiepval Wood disappearing under the hail of shrapnel. Watching his men reach the limit of human endurance, or that they received messages from men less than an hour later were dead. When using the words of the men that were there to describe the toil and strife, it is the pictures that really hammer home the points. When you see the mud, the endless mud or the stumps where trees once stood. One letter sums up the Somme, ‘Darling Moth’, I am so thankful to be alive …’ before listing those friends who are dead. If you want to be chilled to the bones by the description of The Somme, not by historians, but those that were there then this is the book for you. There has been a great deal of research undertaken, both in documents, letters and diaries but also pictorially and it all brings through the sense of idealism dying on the battlefield or more truthfully the battle mud. This is an excellent book, well worth reading and keeping as a reminder why war is not always the answer, and that it is our young that are the ones who are expected to surrender their lives for the greater good. I was first alerted to this book by a many paged feature in the Mail on Sunday a few weeks back in which a fair number of images from this book were published. I bought the book and was delighted, not just by the variety and quality of the images, but by the fact that almost all of them were entirely new to me (and I buy a lot of books on WW1). The book covers the story of the Somme from mid 1915 until the German withdrew in 1917 to the Hindenburg Line, so this is not just a book of the fighting but also of the quieter times before and after the famous offensive. The images are fascinating, the majority are of a high quality you might not expect from cameras of 100 years ago, including shots taken from behind the German lines too. Of course, not all are pin-sharp but that adds to their authenticity - and you'd forgive a man, fighting for his life, for not always composing his pictures when death lurked around the corner. And try taking a picture with woollen mittens in -20 degrees on the Somme in January 1917, one of the coldest in living memory! That said, the vast majority are clear and detailed and, what is more, these are pictures taken by soldiers, not by some Government paid photographer. I loved this book and I haven't even talked about the text! What is most striking about these letters is their ability to make the reader smile, laugh even, as much as cry. We learn a new side to the war that the history books missed out. Van Emden's book does these men a huge service, many of whom deserve a place among the First World War literature greats, and who now will never be forgotten. Book review of sorts. A genuine contender for the "If you're only going to buy one book....." ( That is if you already have Peter Hart's, Lyn Macdonald's, Martin Middlebrook's books on the Somme) This was an eagerly awaited book. Richard Van E is, as it says on the tin, the bestselling World War One author. He is easy to read, doesn't come across as patronising, and he knows his stuff. "The Somme: The Epic Battle in the Soldier's Own Words and Photographs" follows "Tommy's War: The Western Front in Soldier's Words and Photographs"(2014) and "Gallipoli: The Dardanelles Disaster in Soldier's Words and Photographs"(2015 - with Stephen Chambers) in that the Vest Pocket Kodak is the main focus and the photos shown reflect as closely as possible the words that are spoken. It's a winning combination and hopefully not a trilogy. Van E's 'The Somme' is not just about the 1st July, or the ensuing four and a half months that the battle raged on over. There had been a British presence there prior, so the book covers the twenty months, that saw the British forces there. And unlike the Official War Photographs at the time, which were often staged and rarely would the subject be identified by name or regiment, the photos we see (again proper use of the term "never before seen") and the soldiers we see, are named. The faces shown are known to the photographer, and the expressions, from the smiles to the dazed and confused are real. The snappers risked a lot, as the VPK's and similar such cameras were banned, and the penalties for been caught with one were severe - enough that by 1916 there were nowhere near as many as in 1914. The ban was reissued in 1915. The author has been able to use nearly 170 images, and those coupled with diary entries ( the soldiers personal ones, not the Unit War Diaries) and interviews with survivors of the battle, many of which were given to the author whilst they were still alive make this a stand out book. Anyone familiar with Van Emden's books will know and appreciate his narrative style which lacks the blah-blah filler. But for me it's the photos. They capture pals together. Looking at them will make you smile. Some of them look like holiday snaps, which would be of interest only to those involved. But when you consider the backdrop.....many of the men would not survive - in some cases shortly after- and coupled with their words, it stops you in your tracks. It could make you weep. Some of the photos would be sent to families with " this was the last photo taken before he died" type words, and you feel almost like you are seeing something you were not meant to see. In his previous book 'Gallipoli' (with Stephen Chambers who has himself written some s*** hot books) it was a nondescript photo of a bunch of 156th Brigade boys on the deck of the RMS Empress of Britain, embarking at Liverpool for Gallipoli. My great uncle was on that boat. Probably not in the picture, but he was there. Anyone who had a relative who was at the Somme, will be able to see what the place was like. Not the few official staged photos that do the rounds, but the almost ordinariness and routine of the moments captured. Powerful stuff. And on a personal note, my grandad was at the Somme, though thankfully not for the battle. The 1RS were there after 2nd Ypres on their way to Salonika. And thanks to this book, the words of Captain Francis Smith of the 1st Royal Scots give me wee glimpses of what my grandad might have seen. A fantastic book. Well worth it. Thanks to authors such as Van Emden, the voices of those who were there, the fallen and survivors alike, will echo through time. His dedication to ensuring that their story is heard is written across every page. This is the first book that has been published on the battle that uses the soldiers' own photographs to depict the horrors of life in the trenches of this iconic battle. This really is the soldiers' true story, and as such, it is raw and unvarnished, the pictures exhibiting the truth as opposed to the carefully staged pictures taken by the authorities at the time. Van Emden has saved the best until last, finishing his excellent trilogy of books on WW1 with this revelatory collation of first-hand accounts. Time will show it to be a priceless insight into one of the defining struggles of this attritional war. There will be many new books this year, covering the second Battle of the Somme in 1916. If you can only afford to buy one, make this the book you buy. Highly Recommended. Absolutely superb, a new look at an old story. A poignant portrait of camaraderie and courage, remarkable unpublished photographs show Seaforth Highlanders at ease....just months before 1,000 of the regiment were slaughtered on the Somme, 100 years ago this summer. This year marks the centenary of the Somme offensive - the bloodiest battle ever fought by British troops. [This] new book revisits the horrors of the Somme, through the testimony of those who fought there. It was the bloodiest battle in our history. Yet it's taken 100 years to get an insight as vivid as this – from a brilliant new book commemorating the centenary, astonishing photographs taken by soldiers' illicit cameras... and their mesmerising, humbling descriptions of the horrors they endured. Richard van Emden has interviewed over 270 veterans of the Great War and has written widely on the 1914-18 conflict. Previous books include Britain's Last Tommies, Boy Soldiers of the Great War, All Quiet on the Home Front, Prisoners of the Kaiser and the top five best-selling The Trench. He has visited the Somme and Ypres every year since 1985 and has an expert knowledge of the First World War battlefields.